Some of you have asked for the compilation in one place, provided chronologically below, of links to my reporting on the first two Dunbar Village trials for whataboutourdaughters.com. This was as sobering an assignment as I can remember, balanced somewhat by my commitment to provide a straight if nuanced accounting of what I was seeing and hearing, after more than two decades as an opinion writer and editor. 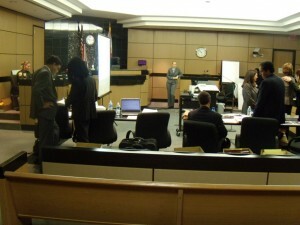 Attorneys confer during break in courtroom as crime scene investigator waits to continue her testimony. Most of the third trial I also observed, although preoccupied then with other projects. At first opportunity I hope to share some thoughts on it all. For now my appreciation again to WAOD and its readers, for contracting with me to be their eyes and ears in and outside the courtroom, on this local tragedy of national and international interest that continues to beg a hopeful ending. Dunbar Village case testimony to begin Friday — or not until Monday? Dunbar Village trial has resumed.